Was King Edward VIII simply a Prince Charming who yielded his throne for "the woman I love" or was he, as recent biographers have claimed, a political naif bewitched by a sexual adventuress? 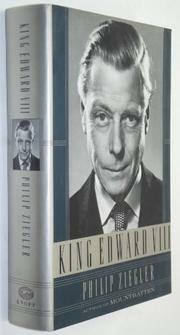 Given access to a wealth of crucial sources, including the Royal Archives and more than 2,000 of the Duke of Windsor's long-lost love letters, Ziegler (Mountbatten, 1985; The Sixth Great Power, 1988, etc.) strikes a balance between the two images in this evenhanded but rueful authorized biography. Ziegler quickly dismisses Charles Higham's sensational gossip (The Duchess of Windsor, 1988)--e.g., lesbianism, prostitution, sadomasochism-yet even what he does tell about the "half child, half genius" described by Prime Minister Stanley Baldwin is painful. At first, Edward won affection with his common touch and his impassioned pleading for WWI veterans and better housing. Yet the winsome royal bachelor, Ziegler shows unmistakably, worried family and associates even before the abdication crisis because he drank too hard, loathed his duties and goldfish-bowl existence, lacked intellectual ballast, carried on affairs with married women, and refused to leave Wallis Simpson, a calculating two-time American divorcee who probably dominated him more through shrewishness than love. The postabdication years as the Flying Dutchman of the royal family are also examined with scrupulous but pained objectivity, particularly the Duke's squabbling with the royal family about his financial settlement, their refusal to accept his bride, and his unwary statements about the Nazi regime in Britain's darkest hours. A well-researched, morally acute portrait of the monarch as Peter Pan, all the more devastating for its author's abundant good will and compassion.